To see how other bloggers have interpreted the ‘Colour’ theme, head over to this week’s Gallery at Sticky Fingers. That is brilliant! I love your photos! That’s a great shot. Nice touch. Good to find you via The Gallery!!! Very nice, very clever. Lovely effect. 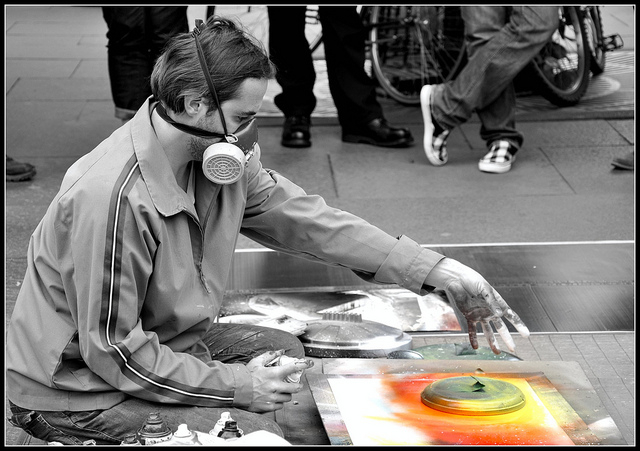 I love watching street artists but I find they just don’t work fast enough and I have to leave before I see the final creation! I love black and white effect photos- beautiful shot! Wow! I really like that – love black & white with a pop of colour. You’re very clever, wish I could do that.